In early December 2011, IPJ Deputy Director Dee Aker and Program Officer Zahra Ismail were in Cambodia for the third Women PeaceMakers Asia Regional Network summit. The seven-day gathering, organized by IPJ Woman PeaceMaker Thavory Huot, provided opportunities to meet with youth, women farmers, Buddhist and Islamic community groups, as well as NGOs and women in political posts locally and nationally. The gathering was supported with funds from UN Women. Upon arrival in Phnom Penh, Zahra and I quickly dropped our bags at a small hotel and headed out to the“Women's Hearings: True Voices of Women during the Khmer Rouge Regime on Sexual Violence.” Theresa de Langis, a former Peace Writer (2007) who subsequently worked for UNIFEM/UN Women in Afghanistan, was facilitating these shadow hearings in Cambodia. Theresa also visited the IPJ in October, as the rapporteur for one of the U.S. civil society consultations on the formulation of a U.S. National Action Plan to implement U.N. Security Resolution 1325. 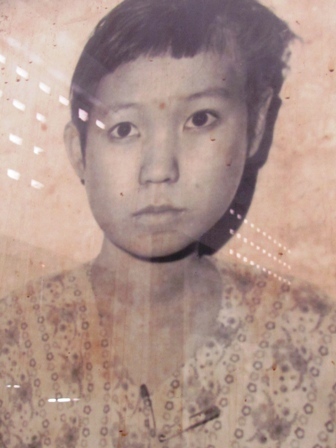 Here in Cambodia's capital, the testimonies of survivors and witnesses of sexual violence under the Khmer Rouge Regime, along with statements from legal experts, were profoundly moving. These crimes have been rejected by the formal tribunals that are currently underway, and the Women's Hearings are an informal effort at validation and redress for the atrocities women suffered. The call for an official tribunal was a key topic in the IPJ's Global Women's Court of Accountability back in 2005, but no one intended or expected that testimonies about the crimes against women would not be included in the tribunal for the mass murderers. There were many young Cambodians in the hearing's audience who were just discovering the true and vast horrors from the time of the Killing Fields. Fear, trauma and simply regaining a life had been the priorities for more than 20 years, so many parents had repressed, moved on from or even denied the terrors they saw and suffered. The loss of so many intellectuals, teachers and leaders, and the brainwashing and forced labor camps had a stifling impact on both truth and its recovery. After the hearings, Wenny Kusuma, who heads the UN Women Cambodia office and has worked on women, peace and security issues for a number of years, joined us for updates and discussion. This intense first day of feeling, seeing and discussing the profound abuse of women's rights set a very real stage for engagement with the IPJ Women PeaceMakers (WPM) of Asia arriving in the home of Cambodian WPM Thavory Huot. By December 9, Zarina Salamat of Pakistan, Manjula Pradeep of India, and Mary Ann Arnado and Bae Liza Saway of the Philippines joined us as Thavory gave a first orientation to Cambodia with a visit to the Killing Fields and Tuol Sleng Prison (S-21), now the Cambodian Genocide Museum. 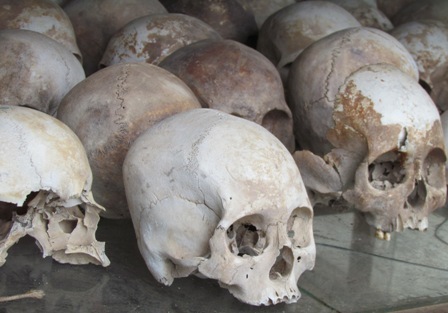 It is estimated that one-third of the population were killed or died of starvation and disease during the 1975-1979 reign of the Khmer Rouge. Dith Pran's story in the film “The Killing Fields” is devastatingly palpable here, as you walk quietly from mass grave to mass grave and to the tree where babies' little bodies were smashed, all the while imagining the “patriotic music” that covered the sounds of dying. 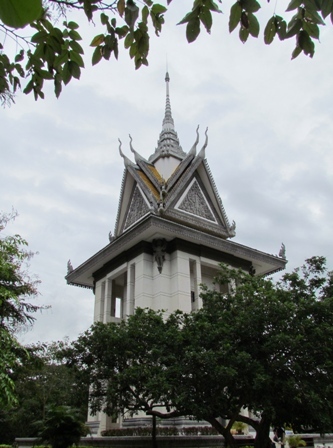 After this awakening to one of the most horrific crimes of the last century, the beautiful glass spiral of the pagoda-like structure where the skulls and bones are now honored, layer upon layer, cannot leave your thoughts or prayers. This week “Brother Number 2” Nuon Chea, the chief ideologue of the Khmer Rouge, admitted vaguely that “perhaps” he had committed war crimes against humanity after hearing the Khmer Rouge tribunal presiding judge list some of the crimes against humanity: murder, extermination, enslavement, forced transfer, imprisonment, torture, persecution on political grounds and genocide. As we walked in humility and tears through the prison where thousands of photos of children, women and men stared back at us, and past the rooms where they were tortured, it seemed odd that there is so little awareness of the tribunal or its shadow hearing for women. Like the Hiroshima and Holocaust museums illustrating the human capacity for unimaginable abuse, people should reflect here on what happened and how it must be prevented from happening again. There are lessons here – for Cambodians and the world. By the evening we were joined by our sixth member, Shobha Shesthra from Nepal, who hosted the first Asian Women PeaceMakers Regional Network meeting early in 2011. This was the opening to a very interesting week of discovering more needs and discussing how the Asian Women PeaceMakers might work together on their common issues and challenges.